This data sets reports biometry measurements of the old-growth upland forest at the Pará Western (Santarém) - km 67, Primary Forest Tower Site. This site is in the Tapajos National Forest located in north central Brazil. Measurements extend from July 1999 through March 2005. 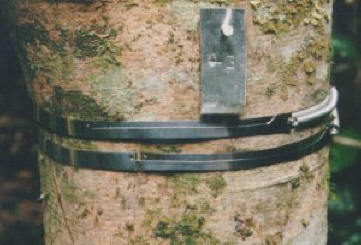 To monitor tree woody increment, metal dendrometer bands (Figure 1) were placed on a sub-sample of 1000 trees in December 1999. The data set contains estimates of tree diameter at breast height (cm) based on caliper measurements made approximately every six weeks. The first column of data refers to the tree identification number. For a more detailed description of the biometry study refer to Rice et al. 2004. The data file contains a time series of DBH (cm) values from July 1999 through March 2005. Figure 1. Dendrometer bands wrap like a belt around a tree at breast height. A spring secures the ends and two measuring points are punched where the band overlaps. An initial diameter at breast height is recorded for each tree. As the tree grows, the spring stretches, and the measuring points are pulled apart. By measuring this increasing distance between points, we can accurately determine the increase in the tree’s diameter. Most trees have only one dendrometer, but this tree was being used to test different dendrometer styles. Tree growth measurements based on repeated dendrometer band measurements at the km67 flux tower site, Tapajos National Forest, Santarem, Para, Brazil. These data may be updated or reprocessed from time to time, and it is your responsibility to insure that your publication contains the most recent revision of the data. The biometry data are reported in one tab-delimited ASCII text file. The data file contains a time series of DBH (cm) values from July 1999 through March 2005. In addition to initial measured values, DBH was calculated as the sum of the increment measured by the dendrometer band and the initial DBH of each tree. NAs in the data set are due to tree mortality. A lowess (locally weighted least squares, http://www.itl.nist.gov/div898/software/dataplot/refman1/ch3/lowess_s.pdf) smoothing algorithm was applied to fill short gaps in the data set. Therefore, a small subset of the reported values were calculated but these values have not been marked in the data file. DOYsince1999.196Column names are the Dendrometer Measurement dates in Julian days counting from 1/1/1999. ... The values reported are the Tree Diameter Measurement in centimeters. NAs in the data set are due to tree mortality. All of the biometry data are reported in lba_km67_dend_dbhs_filled_archive.txt. The data set covers the period 1999/07/15 to 2005/03/29. 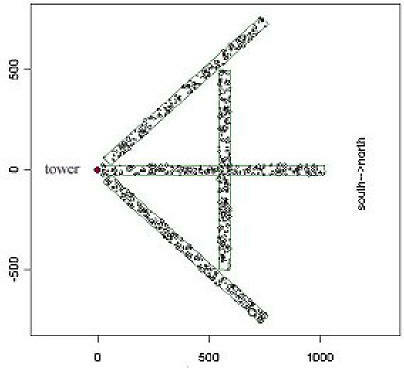 Note: The dendrometers were placed on a random subsample of 993 trees, stratified by taxonomic family and size class. This sampling strategy ensured that all size classes and the full taxonomic diversity were sampled. Due to the stratified nature of the sample, a simple area expansion can not be applied. Please see Rice et al. 2004 for a more detailed explanation. Contact the investigators if you would like the full sample expansion information. Dendrometer band increments, or expansion of the bands with tree growth, were measured every 4 - 6 weeks using electronic calipers, allowing detailed examination of variation in seasonal growth rates. For the dendrometer survey, dbh was determined as the addition of the increment measured by the dendrometer to the initial dbh for each tree. The 1000-tree dendrometry subsample can be scaled up to per unit area flux (G, in Mg C ha^-1 yr^-1) methods described in Rice et al. 2004. Biomass Survey In July of 1999, we surveyed 20 ha of forest in the tower "footprint." Over 2500 trees were measured, identified and mapped in four transects (1000m) east of the tower. Overall, trees were distributed among ~260 species within ~50 families. Common species encountered include Manilkara huberi, Coussarea racemosa, Sclerolobium chrysophyllum, Protium sp., Couratari stellata and Erisma uncinatum. Stainless steel dendrometer bands were placed on a random subsample of 1000 trees, stratified by taxonomic family and size class, in December 1999. The 48 identified taxonomic families were divided into five size classes (10–<22.5, 22.5–<35, 35–<55, 55–<90, and >=90 cm dbh). We included all individual trees in the largest size class (>=90 cm dbh), because large trees account for a major portion of aboveground biomass in neotropical forests (Brown et al. 1995, Clark and Clark 1996). The rest of the sample was drawn randomly from the remaining size-class–taxonomic family categories. This sampling strategy ensures that all size classes and the full diversity of life-history traits (as represented by taxonomic family) were sampled, but avoids repetitively sampling the large number of stems in smaller subgroups that have more limited influence on carbon balance. We banded a large number of trees with the goal of obtaining high-resolution growth measurements that could be correlated to precipitation or seasonality with errors < 10%. Rice, A.H., Hammond, E.P., Saleska, S.R., Hutyra, L., Palace, M., Keller, M., de Carmargo, P.B., Portilho, K., Marques, D., Wofsy, S.C. 2004. Carbon Balance and Vegetation Dynamics in an Old-growth Amazonian Forest. Ecological Applications, 14 (4), s55-s71. Brown, I. F., L. A. Martinelli, W. W. Thomas, M. Z. Moreira, C. A. C. Ferreira, and R. A. Victoria. 1995. Uncertainty in the biomass of Amazonian forests: an example from Rondonia, Brazil. Forest Ecology and Management 75: 175–189. Clark, D. B., and D. A. Clark. 1996. Abundance, growth, and mortality of very large trees in a neotropical lowland rain forest. Forest Ecology and Management 80:235–244. Rice, A.H., E.H. Pyle, S.R. Saleska, L. Hutyra, M. Palace, M. Keller, P.B. de Camargo, K. Portilho, D.F. Marques, and S.C. Wofsy. 2004. Carbon balance and vegetation dynamics in an old-growth Amazonian forest. Ecological Applications 14(4):S55.